Agderforskning (Agder Research) is one of 12 regional research institutes in Norway. They develop and deliver relevant research widely to operators in politics, business and society, regionally, nationally and internationally. 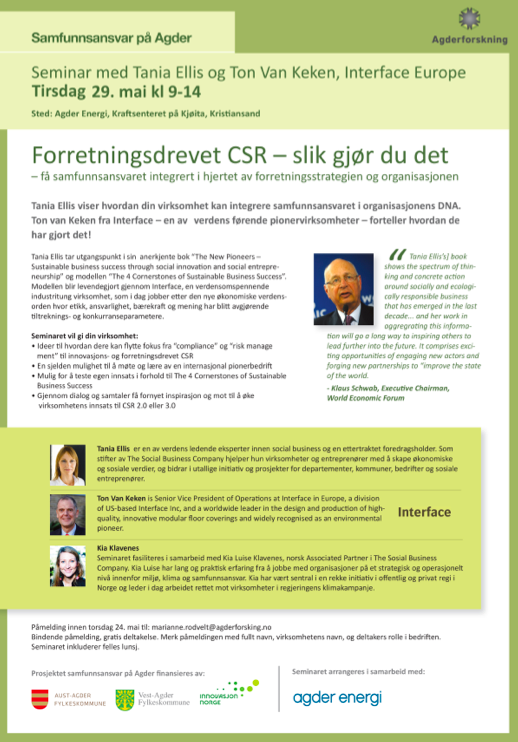 “Forretningsdrevet CSR – slik gjør du det” was the title of a one-day seminar hosted by Agderforskning for their network of Norwegian companies working with CSR and sustainability-related issues. 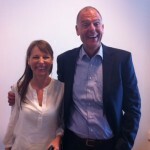 The day was organized by TANIA ELLIS – The Social Business Company together with one of our good contacts in our professional network, international sustainability pioneer, Interface. Business Success: business strategy (Clear Purpose); employee involvement (Corporate Engagement); shared value partnerships (Collaborative Co-creation); and sustainable communication (Clear Communication), and our partner in Norway, Kia Klavenes, facilitated the workshop exercises. Ton Van Keken, Senior Vice President of Interface Operations in Europe, provided a real-life case and shared his experience of how the four cornerstones can be applied and brought to life in an efficient and effective way throughout the organization.